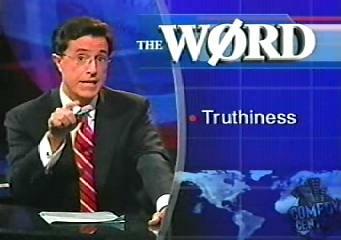 Is Truthiness Holding Back Your Blog? When it comes to blogging, there are endless decisions to be made. How you approach these decisions can be the difference between the success and failure of your blog (of course these words “success” and “failure” will have different definitions to different people). Of course some people have a natural instinct for blogging and it therefore makes perfect sense to follow their gut – Leo Babauta and Seth Godin instantly come to mind as examples. But if your blog is drifting in the doldrums, or even if it has achieved a moderate level of success, what would happen if you relied less on truthiness, and more on the truth? Adsense. If you have read Malcolm Gladwell’s The Tipping Point , you will be well aware that small things can make a big difference. This is especially true when it comes to having Google Adsense on your blog. Small, seemingly insignificant changes – eg placing an ad block on the left rather than the right, choosing a particular color, choosing a particular size, etc – can mean the difference between you making a few cents a day and making some serious dollars. So don’t just rely on your gut when making these decisions. Test, tweak and finely tune your Adsense settings and see what happens. You may be pleasantly surprised. Content. In this recent article on ProBlogger, Wendy Piersall from Sparkplugging wrote that one of her tipping points was: “the day I changed my editorial decisions from what I wanted to say and based them instead on what readers wanted to read as determined by analytics and reader feedback.” Such an approach will not be for everyone, but if you have dreams of your blog becoming wildly popular it may be in your interest to pay better attention to what your readers want via the methods Wendy suggests: analytics and feedback. Feedback. Good constructive feedback can be hard to come by. One suggestion I have relates to subscribers. With Feedburner it is possible to receive an email whenever people unsubscribe. It is then, of course, possible to email them and ask them that all important question: why? Who knows? You may pick up some insight into your blog that you would have otherwise remained clueless to…. Do you have any success stories where you tossed aside truthiness, and instead focused on testing, evidence and feedback to improve your blog? Please share them in the comments below. Thank you to everyone who replied our question last Friday: “how you do motivate yourself?” As a few of you pointed out, the prospect of winning a good book is obviously a very good motivator. We received some fantastic answers, so if you are looking for some motivation related tips and advice be sure to read the responses to the post, How Do You Motivate Yourself? The following readers will receive a copy of Good in a Room: How to Sell Yourself (and Your Ideas) and Win Over Any Audience: Dave from Entreprenurses Community Interest Company, Traveler from Traveler’s Tales, Frank Sconzo, Josh, Benjamin M. Strozykowski from Stroz.net , MLP, Kent from The Financial Philosopher, Salar Madadi from A Man Reborn, Ann from One Bag Nation and Julian. If your name appears here, I will be in contact over the weekend to get your mailing address. If it doesn’t, stay tuned as we have another book giveaway coming up in the near future.